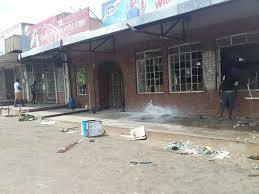 Bulawayo businesspeople whose shops were vandalised and looted by protesters a fortnight ago say they are anxious about restocking, fearing a recurrence. The stayaway, called for by the Zimbabwe Congress of Trade Unions two weeks ago, turned violent and ended in a looting spree and vandalism of property in high-density suburbs such as Nkulumane, Cowdray Park, Pumula, Luveve, Sizinda and Lobengula, among others, with business losing millions of dollars worth of goods in the process. Speaking at a meeting organised by Bulawayo Provincial Affairs minister Judith Ncube to map the way forward, Bulawayo Western Business Association chairperson Busina Tshuma expressed fear over reinvesting in the city. “We are bankrupt, yet we are expected to pay employees who have been forced to sit at home by the situation. The huge taxes as well as suppliers are waiting for a payment plan towards the looted goods that we had not paid for,” Tshuma said. The goods that retailers lost during the raids are said to be uninsurable. Confederation of Zimbabwe Retailers founder and president, Denford Mutashu, said there was need to strengthen the relationship between business and government. “There is need for us to engage insurance companies as business people, but some of us cannot even engage insurance companies, hence the need to have a process that is not discriminatory when coming up with solutions,” he said. Employers present at the meeting spoke about their loss of important documents and information due to the vandalism that transpired during the protests. Women’s Affairs, Community, Small and Medium Enterprises Development minister Sithembiso Nyoni vowed to help rebuild the city. “The economy is driven by businesspeople and not only government; government facilitates,” she said.